Under the "Keywords" tab, enter keywords, and then click "Search." ･ If you separate multiple keywords with spaces, an & (and) search will be performed. ･ The search results are displayed in groups of 10, in order of the newest result first. 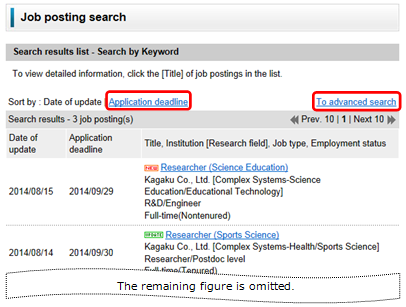 ･ If you click "Application period," the data will be sorted in order of application period. ･ If you click "To advanced search," you can specify an advanced search with additional conditions. ･ "NEW" is displayed next to new information for one week and "UPDATE" is displayed next to updated information for one week. Click the "Title" of the information whose details you want to check. 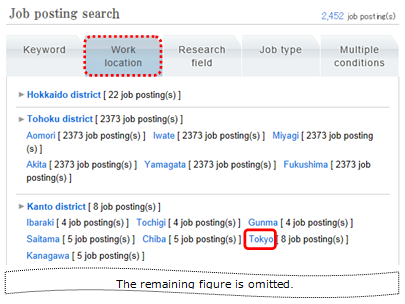 Under the "work locations" tab, click the target work location. 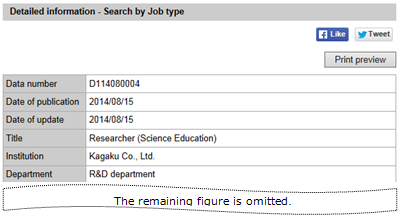 ･ The search results are displayed in groups of 50, in order of the newest result first. 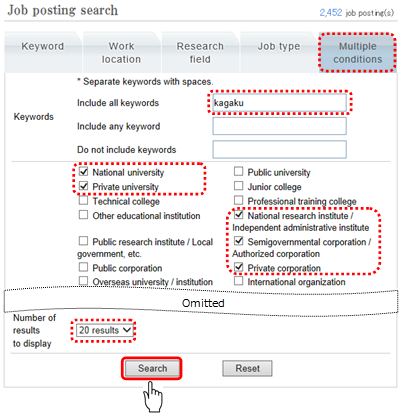 Select the Area and Discipline from their pull-down lists, and then click "Search." 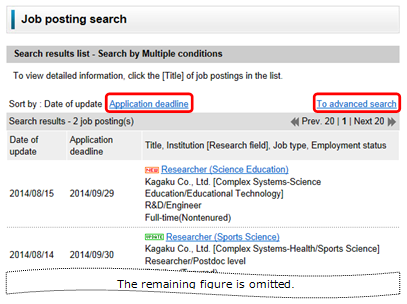 ･ You can click "List of research fields" to view the list of research fields. 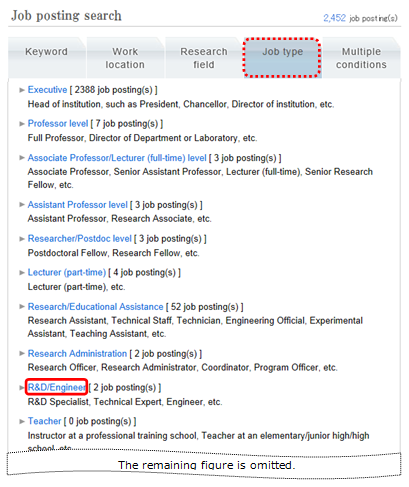 Click the target Job type. Under the "Multiple conditions" tab, set the following conditions, and then click "Search." ･ The search results are displayed in order of the newest result first. 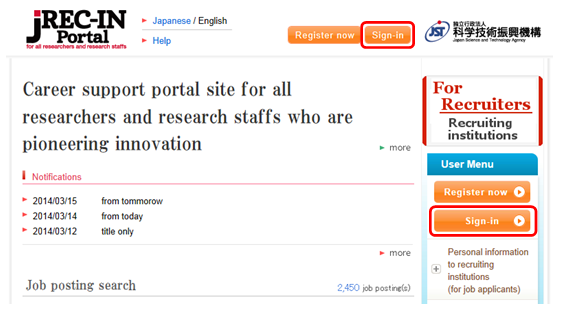 Click "Register now" at the top of the JREC-IN Portal top page or in the "User Menu" on the right side of the screen. The "As the registration starts" and "Membership Regulations" explanatory screens will be displayed. Read the details and then click "Agree to the above regulations and register." Enter e-mail address, and then click "Submit." "E-mail successfully sent screen" is displayed. An e-mail requesting that you set your password will be automatically sent to the e-mail address that you entered. Check that you have received the e-mail, and then use your web browser to access the URL contained in the e-mail. If the URL contained in the e-mail takes up two or more lines, access it by entering the whole URL into your web browser. Upon accessing the URL given in the e-mail from a web browser, the "Enter the basic information of your account" screen will be displayed. Enter mandatory items, and then click "Confirm." Confirm the entered details, enter a password, and then click "Register." 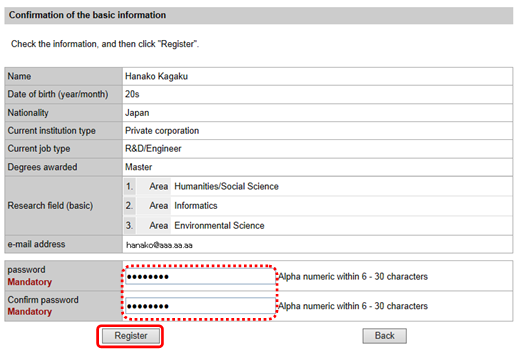 When the "Completed registering basic information" screen is displayed, the registration is finished. 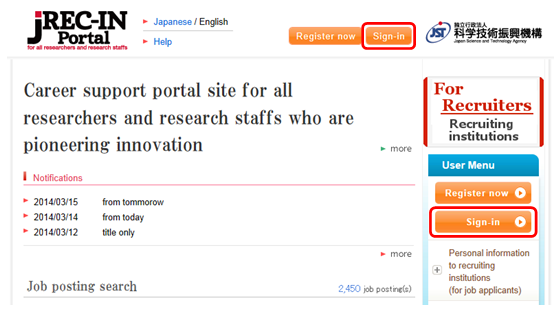 Click "Sign-in" at the top of the JREC-IN Portal top page or in the "User Menu" on the right side of the screen. Enter e-mail address and a password, and then click "Sign-in." 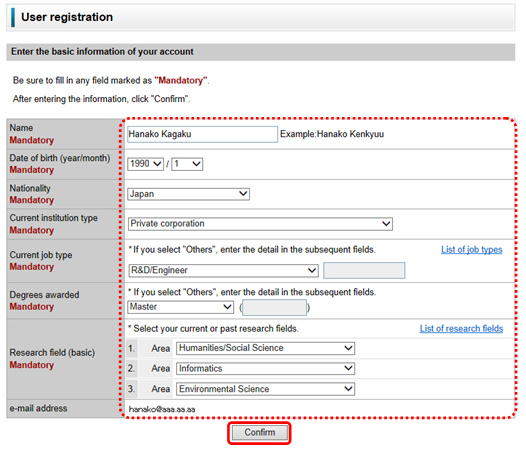 For further information on how to sign in and use the service with a researchmap ID, see Q10 under "FAQ." When you sign in, the User top page will be displayed. 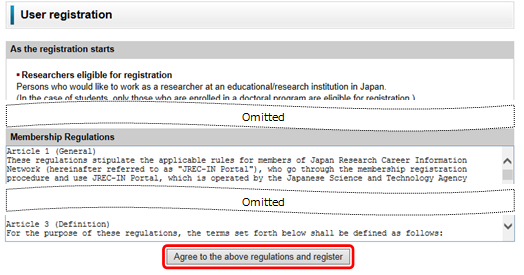 Click "Sign-out" at the top of the JREC-IN Portal top page or in the "User Menu" on the right side of the screen. 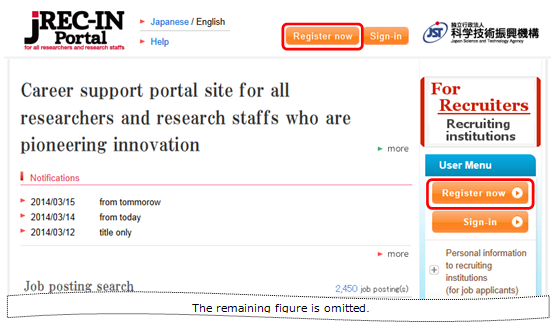 ･ When you finish using your User page, click "Sign-out" or close your browser. ･ You will be automatically signed out if you do not perform any operation for 60 minutes. Click "Forgot your password?" in the lower-right of the screen. The "Registering a new password" screen is displayed. Enter the e-mail address that you will use to sign in, and then click "Submit." "E-mail successfully sent" screen is displayed. An e-mail requesting that you set your password will be automatically sent to the e-mail address that you entered. Check that you have received the e-mail. Upon accessing the URL given in the e-mail from a web browser, the "Registering a new password" screen will be displayed. Enter the new password, and then click "Submit." When the "Completed registering password" screen is displayed, the new password is registered. 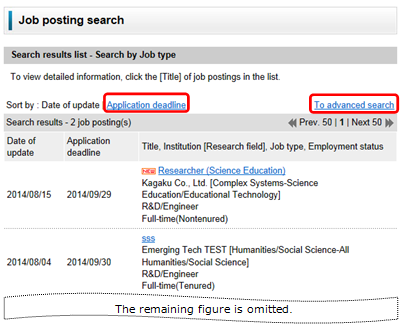 Click the "For Recruiters" in the upper-right of the JREC-IN Portal top page. Recruiting Institutions page will be displayed. 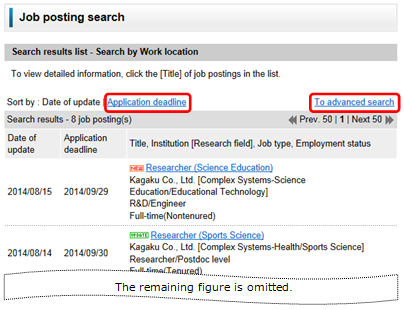 Read the details of "As the registration starts" and then click "Register" in the "Recruiting Institution registration" on the right side of the screen. Regulations for Recruiting Institutions will be displayed. Read the details and then click "Agree to the above regulations and register as a Recruiting Institution." 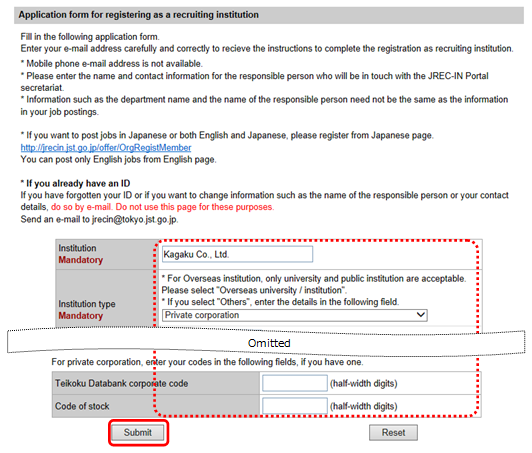 "Application form for registering as a Recruiting Institution" screen is displayed. Enter mandatory items, and then click "Confirm." Confirm the entered details, and then click "Apply." "Application received" screen will be displayed. After checking the details, the secretariat will send you an e-mail. Note that you will not receive this e-mail immediately after submitting your application. 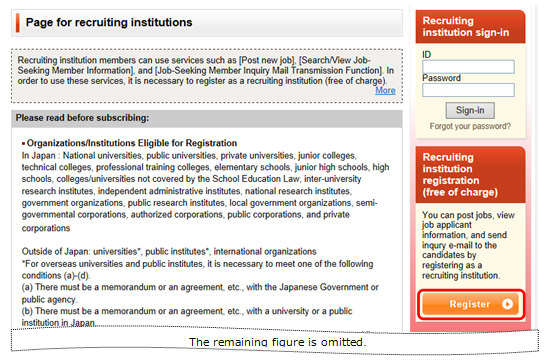 To sign in, you must use the "Recruiting Institution ID" contained in the e-mail. Be sure to check this information. 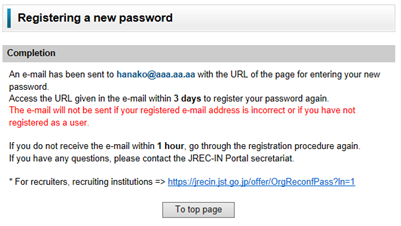 Upon accessing the URL given in the e-mail from a web browser, the "Registering password" screen will be displayed. Enter a password, and then click "OK."
When the "Completed registering password" screen is displayed, the registration is finished. 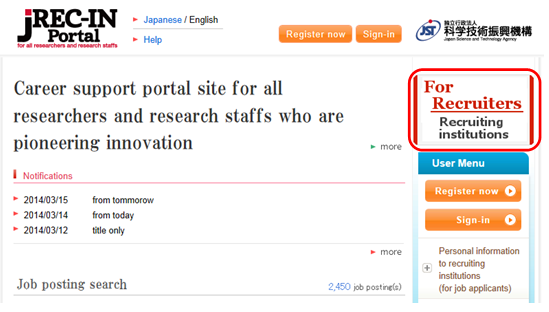 Click "For Recruiters" in the upper-right of the JREC-IN Portal top page. Enter your ID and password under "Recruiting Institution sign-in" in the upper-right of the screen, and then click "Sign-in." 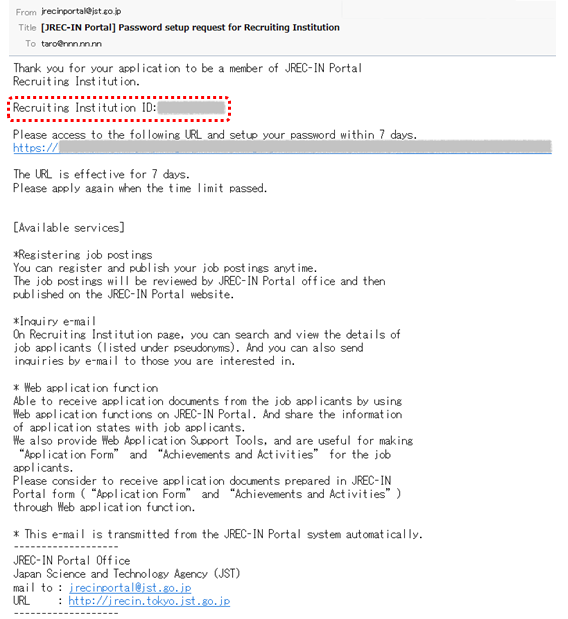 ･ Your ID is the "Recruiting Institution ID" contained in the e-mail request to set password (e-mail subjected "JREC-IN Portal password setting request for Recruiting Institution ID." When you sign in, the Recruiting Institution top page will be displayed. 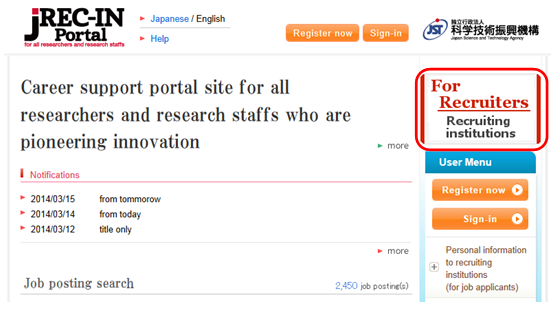 Click "Sign-out" at the top of the JREC-IN Portal top page. ･ When you finish using your Recruiting Institution page, click "Sign-out" or close your browser. Click "Forgot your password?" under the "Sign-in" button under "Recruiting Institution sign-in." 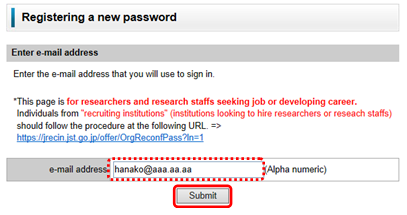 An e-mail requesting that you set your password will be automatically sent to the e-mail address that is registered. Check that you have received the e-mail, and then use your web browser to access the URL contained in the e-mail.